Gin Fizz brings you the sparkling sounds of the 1920s, 30s, 40s and 50s. 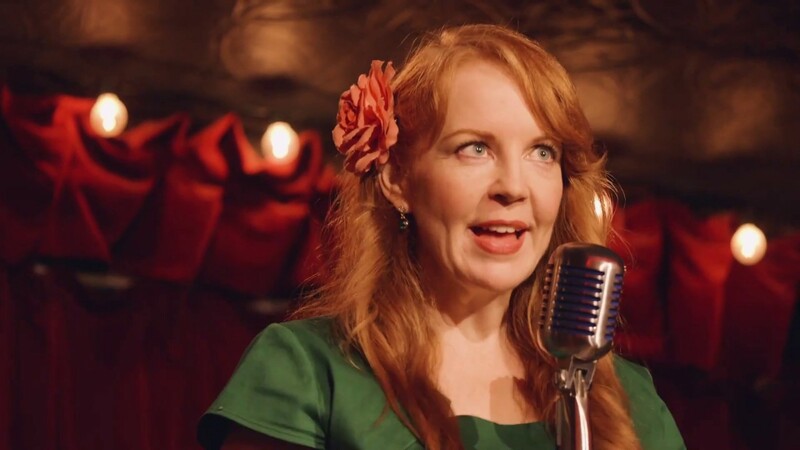 From hot jazz to sultry ballads to French swing, Gin Fizz plays these vintage gems with hip, youthful exuberance, while capturing the romance of a bygone era. This band of virtuoso musicians is sure to delight music lovers both young and old with their warm and vibrant renditions of these captivating tunes. From the first contact to the last number they played, we could not have been more pleased with Gin Fizz. They are the kind of fine musicians that make you think "What are they doing playing weddings?" 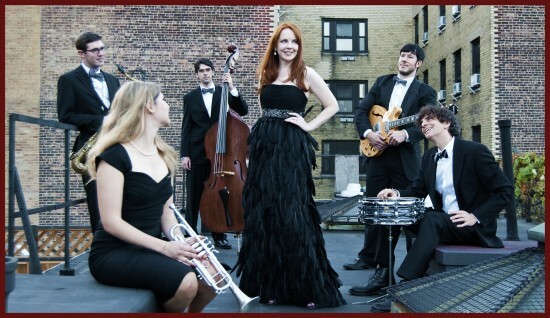 --they know the world of jazz, swing, and standards so well that you'll feel the comforting familiarity of songs you love played supremely well, and marvel at the same time at the unique, stylish spin they give many numbers. They were accommodating when it came to a somewhat limited budget we had, and Ms. Crawford was patient and good-humored when it came to dealing with specifics we asked them to cover. Our guests--many of whom have been professional musicians themselves--were, to a person, impressed (often ecstatically so) by the music. We feel so fortunate to look back fondly on so many things about that day, but the music is very near the top of that list. We can't recommend them highly enough--it will be your great fortune if they happen to be available for your big day. Thank you so much for the kind words. Your wedding was absolutely beautiful and your guests lovely! Some of the best wedding speeches and the most gracious and accommodating bride and groom. 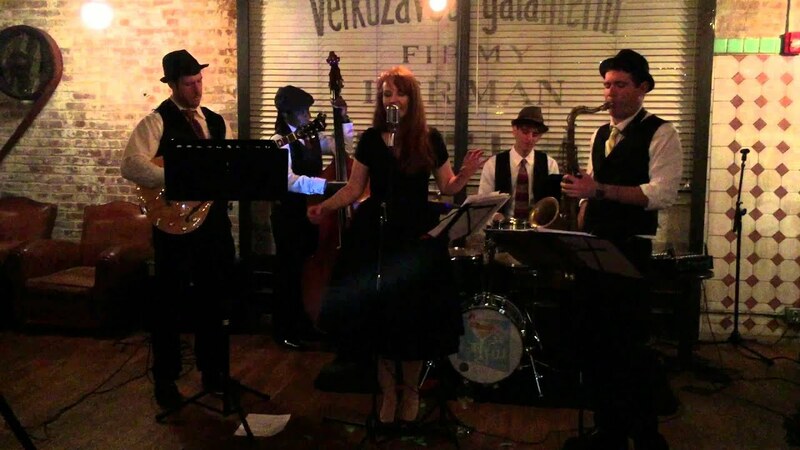 Gin Fizz performed at our Berlin Karbarett Abend which was held this past November. They were so awesome that everyone is still talking about that night. Our German club usually features German bands but wanted to go with something a little different. We wanted music from the late 20's and 30's and they were spot on. They were very professional to work with and very accomodating. The musicans were great and Bridget's voice was out of this world. Hoping to get them back for a 40's swing night in the spring. 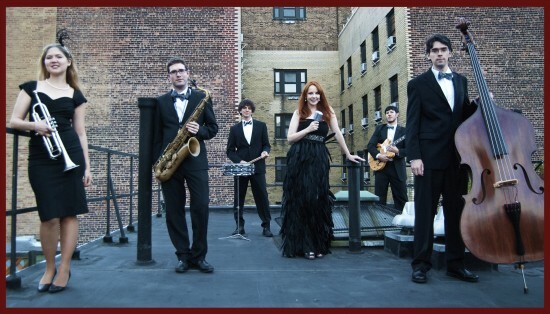 You won't regret having this band perform at your event. 5 stars all the way. I can't speak more highly of them!!! Thanks, Eric! We had a great time playing at the Club - what a great venue! Brandon and Nancy, thanks so much for the kind words! It was a joy playing your beautiful wedding! Gin Fizz was simply spectacular! Bridget was so amazing to work with and everything went so smoothly! It was just amazing! Our first dance was a particular request and they performed it so well! Honestly I can't say enough amazing things about them. Our guests were on the dance floor all night! Thanks so much for your kind words, Bridgette! Your wedding was gorgeous! Every detail was perfect and your guest were a blast! Thanks for including us. First class band! Excellent show! We invited Gin Fizz to appear as part of our Nite Spot Nights performance series. What a great show! Bridget and the band are a top notch act. They played a wonderful 90-minute set of standard tunes spanning the 20's to the 60's--all songs with which the audiences were familiar. Their banter was fun and the evening was a big success. In addition, communication prior to the event was perfect and their arrival and set up was a breeze. I highly recommend Gin Fizz! Thanks so much, Bert! What a great audience! We absolutely loved performing at your theatre. Bridget and friends traveled to Philadelphia to play our wedding ceremony and reception in the Wissahickon Valley (a ~2-hour trip from NYC). Their live music set a classic moody in the wooded valley and all of our guests complimented their sound, expertise, and range--which included 2 and 3-piece instrumentals, full-band music, and solo singing by Bridget herself. They were even kind enough to learn a new song for our wedding dance. Overall, we're truly appreciative of their talents and feel as though our best money was spent on their services. Thanks so much, Eugene! Your wedding was beautiful -- what a setting! Thanks so much for letting us be a part of it. This group was fantastic. First off, they played out entire wedding! They were easy to reach, responded quickly, extremely adaptable and wonderfully professional. Out of the entire wedding, this was the only part of the wedding I felt confident in. Bridget worked with us to help us pick modern songs to fit into the 1920s theme we had chosen. She called us to help get some ideas and fill out the finer details. She then took steps herself to work with the venue to ensure they had everything that was needed for their performance. The value for the product they provided was amazing. I shopped around and received quotes that were completely unreasonable, but Bridget worked with us to ensure she matched out budget. I can't recommend this group enough. The talent, artistic knowledge and charisma they brought to our wedding will forever be remember by myself, my wife and everyone in attendance. Thanks so much Justin! Your wedding was amazing! Thanks so much for including us in the big day! Gln Flizz was simply wonderful to work with. We worked with them on our NYE event and they made everyone's night just so much better. They were very flexible with our requests, on time, very professional, talented and very delightful. Also they sounded just perfect! We were extremely impressed with how smooth everything went all night, it made our restaurant look so much better on a very very busy night. It was as if they knew our restaurant very well and performed here many times before. We look forward to working with them in many more events. Thanks, Ayten! What a great new year's eve blast! Thanks for letting us be part of the celebration. We will provide all instruments and can provide microphones, pick-ups, etc. If we need to provide a PA, an additional fee will be assessed (the amount will be based up the size of the PA needed for the event, set up of same and distance that it will need to be transported). We also need a performance area large enough to accommodate the band and their instruments (we are equally comfortable on a stage or tucked into a little corner) and somewhere we can safely leave belongings during the sets. If Gin Fizz provides a PA for the event, there will be an additional charge.